Other Latin names: Ficus carolinensis Warb. ; Ficus caulobotrya var. fraseri (Miq.) Miq. ; Ficus cunninghamii (Miq.) Miq. ; Ficus glabella Blume; Ficus glabella var. nesophila (Miq.) K.Schum. ; Ficus infectoria auct. AND Willd. ; Ficus infectoria var. cunninghamii (Miq.) Domin; Ficus infectoria var. fraseri (Miq.) Domin; Ficus infectoria var. psychotriifolium (Miq.) Domin; Ficus infectoria var. typica Domin; Ficus lacor Buch.-Ham. ; Ficus mariannensis Merr. 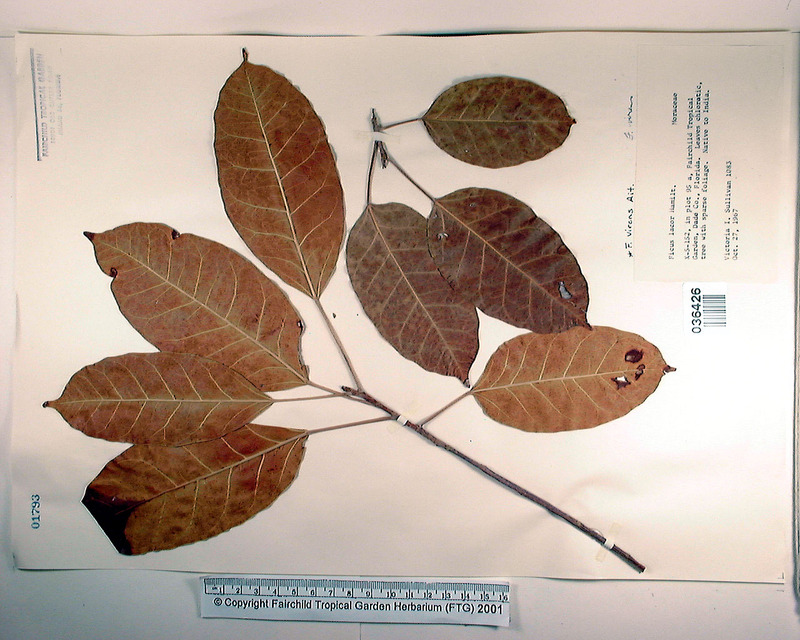 ; Ficus nesophila (Miq.) Miq. ; Ficus prolixa G.Forst. var. carolinensis (Warb.) Fosb. ; Ficus psychotriifolia (Miq.) Miq. ; Ficus saxophila Blume var. sublanceolata Miq. ; Ficus virens Aiton var. glabella (Blume) Corner; Ficus virens Aiton var. sublanceolata (Miq.) Corner; Ficus virens Aiton var. wightiana (Miq.) V. Chithra; Ficus wightiana (Miq.) Wall. ex Benth. ; Urostigma cunninghamii Miq. ; Urostigma fraseri Miq. ; Urostigma nesophilium Miq. ; Urostigma psychotriifolium Miq. ; Urostigma wightianum Miq. See also Australian Tropical Rainforest Plants. "ranges from Sri Lanka to the Solomon Islands"
Control: If you know of control methods for Ficus virens, please let us know. This page was created on 12 SEP 2017 and was last updated on 31 OCT 2018.